After a shopping morning in Edinburgh, I met Val Bierman, one of the editors of Carousel, the only magazine dedicated to children’s books. 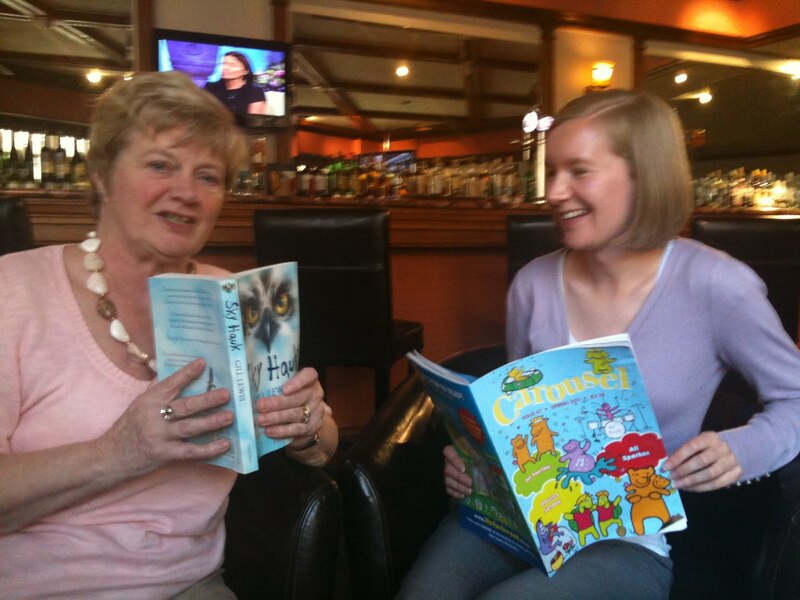 What Val doesn’t know about children’s books probably isn’t worth knowing. We had a cuppa tea, a good old chat about Sky Hawk, children’s books and lots of other things besides. 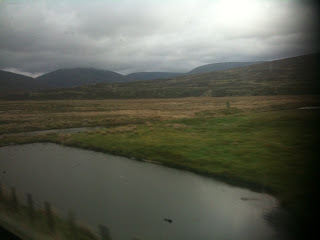 I didn’t get time to have a second cuppa, because I had to catch the train heading north, up into the Highlands. Some folks on that train had been sitting there since London! As the train climbed up into the mountains and the rain smattered against the windows and cloud swirled around the carriages, I began to think wearing flip flops wasn’t such a great idea. There’s still snow up on the mountains too. I woke to red squirrels scurrying up and town the tree outside my window and this amazing view. After a full Scottish breakfast (including haggis! 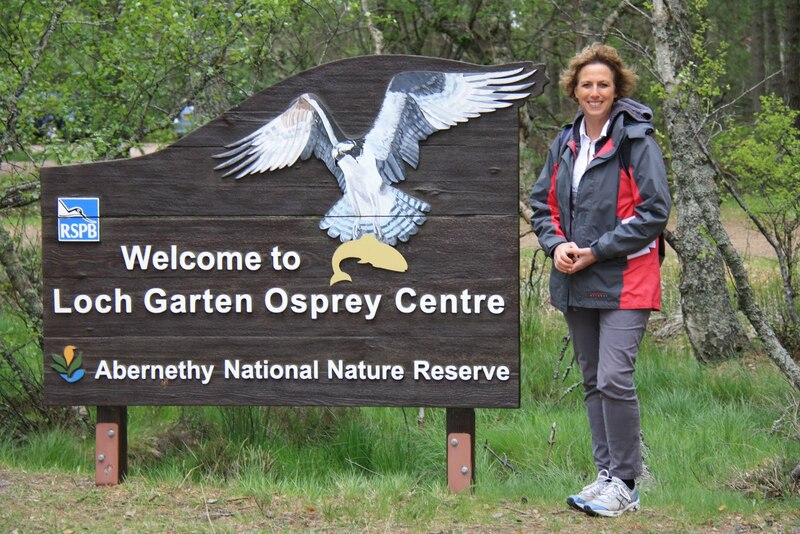 ), I set off for the Loch Garten Osprey Centre. 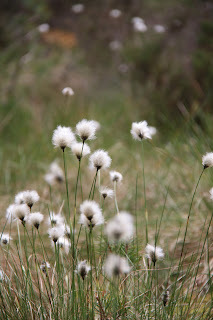 Surrounded by native Caledonian pine forest, and carpeted in white tufted bog cotton, the centre is an incredible place. The protected ospreys and their nest are visible from the centre. There are cameras linked to the nest, so you can get a real close up of everything going on in the nest too. At the moment the ospreys are incubating their eggs. The RSPB wardens think they could hatch out next week!! 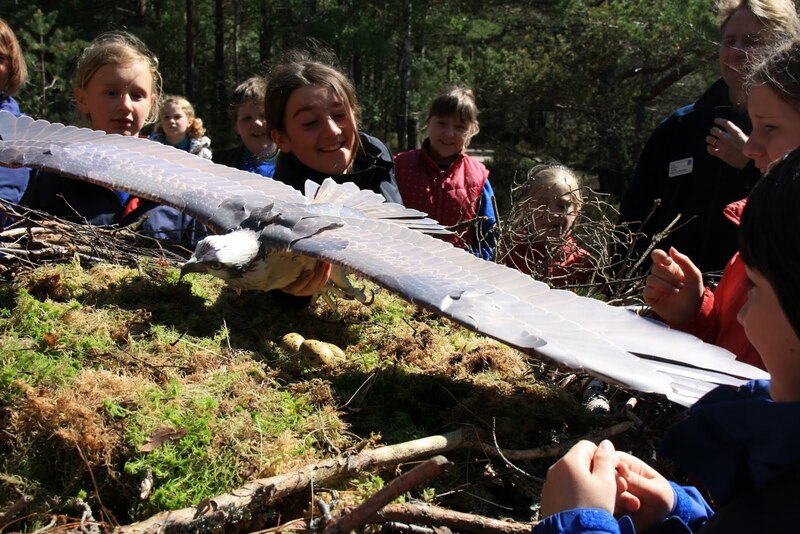 So have a look online at the live webcam of the Loch Garten ospreys and you might have a nice surprise next week. I can’t wait to see the chicks. Paul was telling me that when the first ospreys returned to our country in 1956, the Loch Garten centre was set up so that people could come and see the ospreys and learn about them. The conservation work has been so successful than there are now 200 breeding pairs in Scotland. Sadly though, not everyone wants to protect these amazing birds. A clutch of eggs at an unprotected site was stolen only last Sunday. 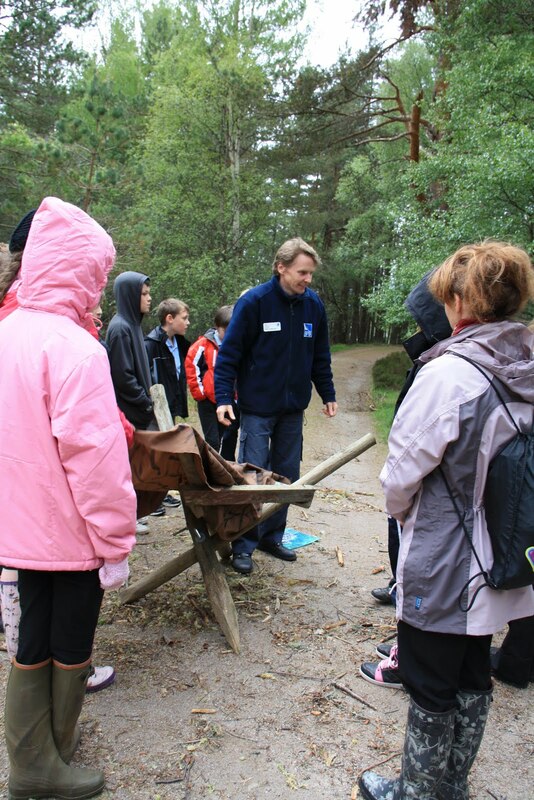 I met up with Paul Kendall and pupils from Abernethy and Deshar primary schools. I admit to feeling very envious. I’d have loved to have grown up in a place like this, surrounded by forests and mountains and all this wildlife. 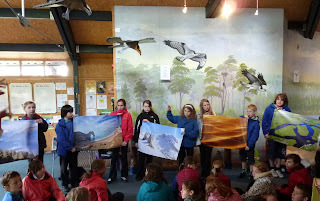 We talked about the book, the migration route of ospreys and also how birds are adapted for flight. I was so impressed by the children’s knowledge and their concern for their environment. 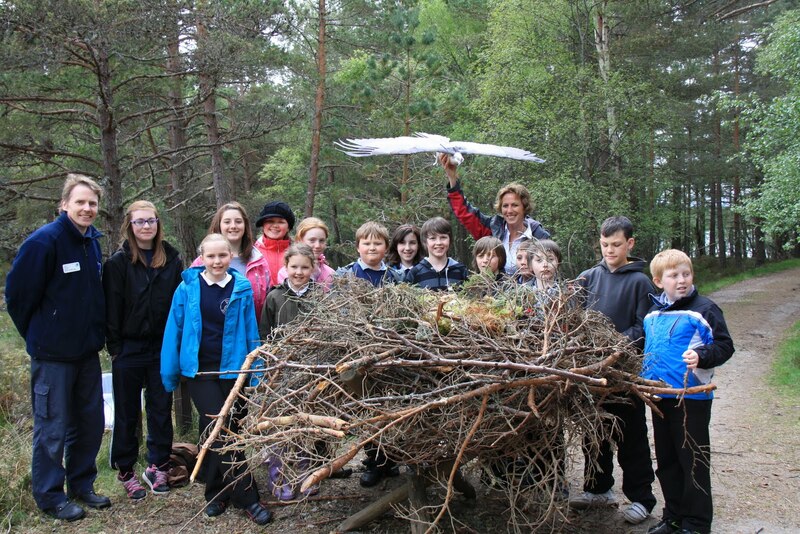 The Paul took us all outside for a really fun event…making an osprey nest!!!!!! 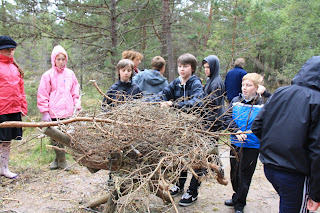 Here’s the wooden structure that we had to build our nest on. The males make the main structure of the nest and the female collects the soft moss. She even rearranges the sticks the make had brought in, if she doesn’t think they are to her liking!! 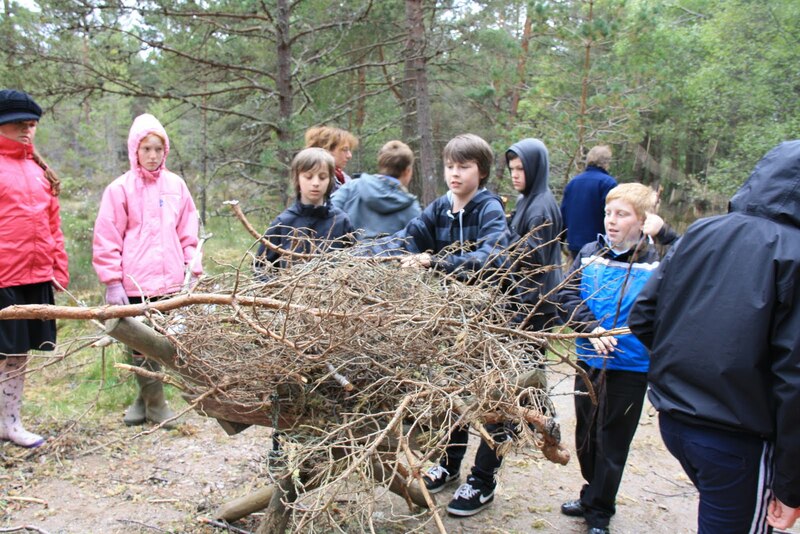 Here’s the finished nest…it took about 20 minutes with lots of children helping…but obviously ospreys have to fly with each stick high up to the top of a tree…so it takes them a lot longer. 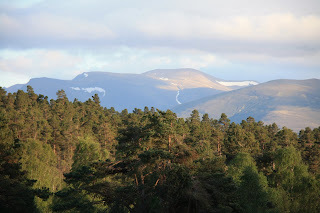 After a great day…I took an evening walk from my hotel through the forest and spotted deer and red squirrels…then back to the hotel to have a slap up meal of Scottish trout and then pineapple and ginger pudding with clotted cream ice-cream. 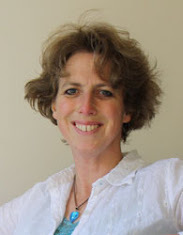 Sometimes it’s a tough life, being an author! !